You have to see the flash in broad daylight of our smallest Firestorm payload. This round is a 7.62 X 39MM shot in broad daylight. Other people will show you an incendiary round of theirs impacting a steel plate in pitch darkness that doesn’t look as good as ours. Our ammo is loaded from NEW shell casings, not once fired brass like others. Our formula is the same as US Army forces used in WW II and was used to not only punch holes in aircraft and vehicles, but to catch them on fire as well. The momentary flame is 3,000 degrees Fahrenheit. Paper ignites at 451. 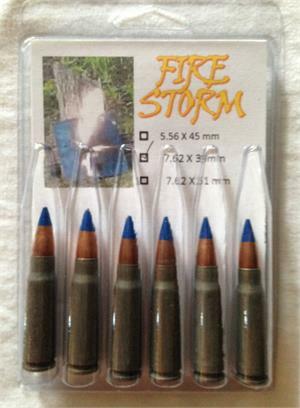 When you absolutely, positively have to catch it on fire, reach for the Firestorm.